Shandong Leader Machinery Co.,Ltd. is a company specialized in producing twin-screw food extruder, single screw extruder, microwave roasting and sterilization equipments, etc. While based upon domestic market, the company opens and exploits market abroad positively. Until now, our products Microwave Thawing and Heating Equipment have been exported many counties and regions, including Russia, Europe, Africa, Korea, Indonesia, UZ (Uzbekistan) and the market share increases gradually year by year. Shandong Leader Machinery Co.,Ltd. will continue to be aggressive, creative and make a contribution to our country’s food industry development with peers home and abroad. Microwave Thawing and Heating Equipment used in the thawing of meat products and seafood, stable equipment performance, reliable quality, short thawing time, is ideal for high-tech meat products defrost equipment. Microwave Thawing and Heating Malt drying and ripening Equipment all stainless steel manufacturing, in line with food production standards Microwave thawing is the use of polar molecule vibration to produce the elastic collision with the surrounding molecules, friction heat, Microwave Thawing and Heating Malt drying and ripening Equipment heating mode from the product materials produced inside, Microwave Thawing and Heating Equipment use this method to warm thawing food with low production cost, high efficiency, Product aseptic growth and the advantages of small footprint, Microwave Thawing and Heating Malt drying and ripening Equipment is the other process methods can not be compared. Large Microwave Thawing and Heating Equipment can be used to thaw meat, all kinds of fish, roe and other frozen seafood, Microwave Thawing and Heating Malt drying and ripening Equipment possible to achieve both frozen frozen products in the processing, can also be completely thawed, aging and so on. Microwave Thawing and Heating Equipment is characterized not thaw thaw, keeping intact the characteristics of the product. Microwave Thawing and Heating Equipment 915MHz using microwave frequency microwave generator, which is far superior penetration 2450MHz microwave source, mono- 20kW source, the device do 20kw-100kw, generally if the materials to be applied in the reprocessing thawing, after thawing temperature was maintained at - about 5 ° ~ 1 ° xiao most thawed in an amount of 500-1000kg / h. Recently I developed a big opening for microwave thawing equipment has been widely put into application. 6). 1 year complete warranty for Microwave Thawing and Heating Malt drying and ripening Equipment . 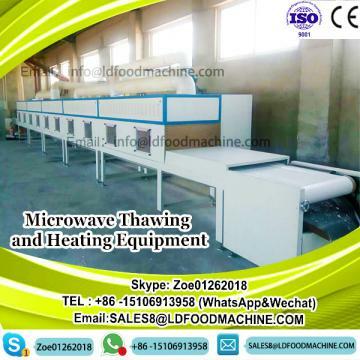 Microwave Thawing and Heating Equipment is mainly in: seafood, aquatic products, chicken Deputy category, Ducks category, Goose Deputy category, pig, cattle, sheep, pill cakes, fruits, other agricultural products such as fleshy or not fleshy frozen products of rapid thawing. Microwaves can be directly heated inside the material without the need for a heat conduction process. Therefore, frozen meat through the continuous tunnel-type thawing system, improve production efficiency, greatly saving the thawing time. Change from "Days" to "minutes". For the weight of 25Kg, the overall size of the frozen meat 600mmx400mmx150mm-18 ℃ around the microwave to thaw the equipment in just 2-4 minutes can be back to the -4℃~-2℃.